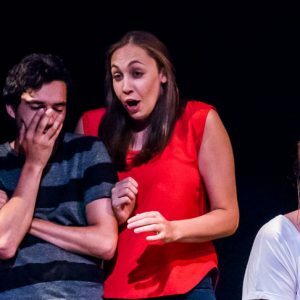 Sarah has been hooked on improv since her first class at WIT in 2015, which combined her two favorite things: comedy and meeting people who share a passion for bad Lifetime movies. She completed the WIT curriculum and has performed with Fighting Improv Smackdown Tournament team The Leftovers. She also regularly listens to Tina Fey’s Bossypants audiobook while jogging slowly. Originally from the Chicago suburbs, Sarah has stopped her Midwestern-friendly tradition of smiling at strangers on the street because it freaks people out in DC. She once ran a summer camp and therefore knows the handshake from The Parent Trap, a talent that she likes to show off at parties. In her spare time, Sarah enjoys cheeses, Netflix, and showing people pictures of her nieces and nephew.